Don’t bother about what others have to say about you. Let them say what they want to. You simply be yourself. Yesterday’s swearing-in ceremony of Narendra Modi and his team was indeed a great moment in Indian history. Such a grand, peaceful transfer of power in the largest democracy in the world – it made me feel very proud as an Indian. 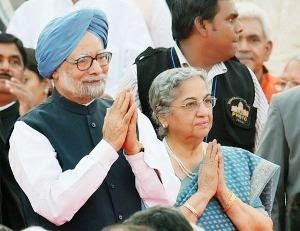 I was particularly inspired by the outgoing Prime Minister (PM) Dr.Manmohan Singh’s demeanor. He was cool, calm and cheerful. The whole nation had ridiculed him and continued to do so, even as the live TV telecast of yesterday’s ceremony was on. For instance, Suhel Seth, socialite and strategic brand advisory Counselage’s founder, thundered on NDTV, “For God’s sake, for 10 years, we had a PM who did nothing!”. Such exaggerations have been a consistent feature of all political commentaries during Dr.Singh’s tenure as PM. Yet, barring a couple of times, Dr.Singh has never deemed it necessary to clarify. I am not here to moderate a debate on whether Dr.Singh was an effective PM or not, or appraise whether he fell abysmally short on communicating with the people of India, or even comment on whether his leadership of the various crises his government and the country faced was good enough. All I am seeing as a learning here is that he remains unruffled by others’ opinion of him. To the extent that he graciously participated in the handover of his office – without even letting a glimpse be evident of the gloom that has enveloped his party and erstwhile council of ministers, thanks to the mauling they received in the just-concluded elections. Now to be able to stay true to yourself – no matter what others say – well, that’s a phenomenal quality. Contrast this with how sometimes you – and I – get bogged down by others’ opinion. In fact, if you observe yourself closely, you are most of the time working hard to conform to other people’s opinions of you. What you wear, where you live, what you drive, where you dine – everything is dictated by a societal norm and you, just as everyone else, fears any deviation. Some years back I met a Sanskrit scholar and yogi, attached to one of the five seats of vedic learning in India. He knew I had worked at one time with India Today. He wanted to know if I could help him get into the “famed” ‘India Today Power List” that the magazine brings out annually. Now, here was a man, whom ministers feared. Actors and industrialists revered him. Yet, he was craving to be in listed in a social pecking order? I asked him why. He replied, “Saar, it doesn’t matter who I am. What matters is who I am compared with.” This is what’s happening to everyone. The Times of India this morning carries a story titled: “Who sat where; the ‘other’ pecking order” – in reference to where celebrities sat among the 5000-member audience at Modi’s swearing in. Apart from personal comfort – of either viewing or traveling – it does not matter where you sit in an event or an auditorium or on a plane. To me, most of the 5000 people in attendance at the Forecourt of the Rashtrapathi Bhavan yesterday were uncomfortable – sheerly because of their choice of clothing. In the 38-degree-plus heat of a summer evening in Delhi, people were wearing suits and bandhgalas and silks sarees and full-sleeved designer clothes. These people would have been better of thinking about how they were feeling than worry about where they were seated! Indian society, in particular New Delhi’s power class, holds you hostage to pride and prejudice. You become the dumping ground for people’s opinions of you. You then try to be many things to many people. And, in the process, sadly, lose your own identity. People praise you, praise you dress sense, applaud you for where you live – and immediately you have become a victim. You are now a hostage to their opinion. You cannot live any other way. Then, as will always happen in Life, your business fails or you lose something – power or position – and people don’t want to have anything with you. And you start grieving that loss of social acceptance more than what you have lost in real terms. You are driven by what other people think of you than who you really are. This way you have become society’s slave, imprisoned by your own insecurities and craving for social acceptance! But the one who does not think much of others’ opinions is free. Such a person is fearless of societal branding – aware that just as when society can pin a label, an opinion – let us say enormous praise over something genuinely well done – it can also take off the label when there’s a drop in performance. Pretty much, perhaps, like in Dr.Singh’s case. Neither success nor defeat affects such a person. Nor does praise or criticism. Such a person always responds to all that is said – good, bad, ugly – of him or her with a, “Thank You! It does not matter. I am who I am.” This equanimity is what leads to inner peace!